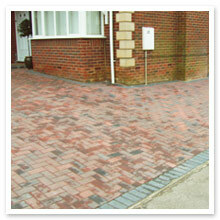 A driveway is the first thing people will look at on entering your property – it’s the red carpet to your doorway! So it is imperative that your driveway doesn’t succumb to poor condition otherwise the rest of your property is destined for a bad reputation. But often driveways can become rundown and potentially dangerous due to constant use from vehicles and people, causing the materials to break-up and become loose. Here at Garden Force we can provide you with a sturdy driveway in Northamptonshire or Wellingborough which will rejuvenate your drive area and complete the overall appearance of your property. Our team have the relevant experience and skills to install fantastic block paved driveways or paths with a wide range of block paving to suit your requirements, down to cost efficient gravel driveways, both of which can do wonders for the functionality and aesthetics of your property. We believe in fast, efficient and effective driveway work which will do little to interrupt your daily routine, and we use only the highest quality materials to get the job done to the highest of standards. Do not entrust ‘cowboy’ builders who offer ridiculously low prices but only do half the job – if that! Instead, use the resources and workmanship that we have to offer to get your driveway looking exceptional again, and all at affordable prices. We specialise in heavy duty, durable concrete driveways, and cost efficient driveways, meaning we have the driveway to suit your budget and your needs. Look no further than Garden Force for all your driveway needs and get in touch with us on 01933 394484 or 07909833575 today.